This is a free and fun printable game that can be enjoyed by anyone. You can play this game in co-ed showers as well. I have made free printables for this word mining game for bridal shower in three colors so you can print the color that matches the theme of your bridal shower party the most. How to Play: Take print outs of this game card according to the number of your bridal shower party guests. Write down name of the bride-to-be on each card before distributing it among your guests. 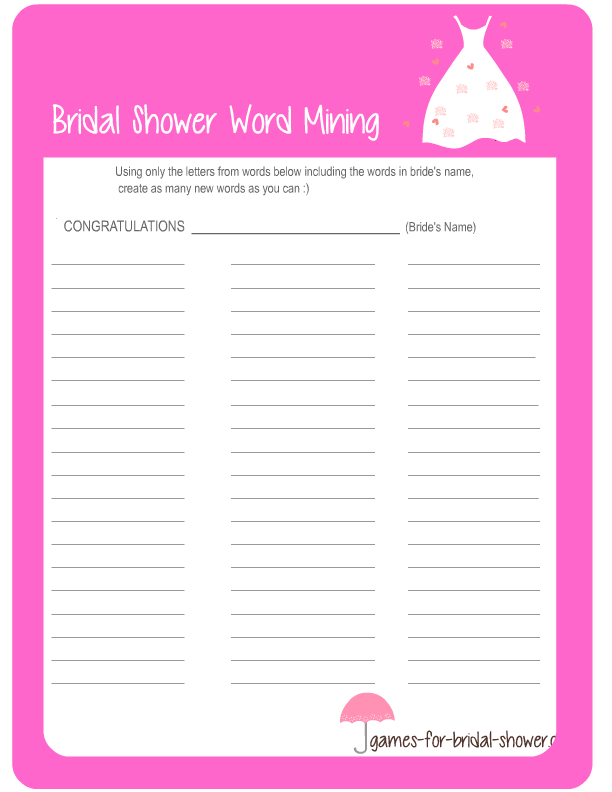 Ask your guests to make as many words as they can using the word 'congratulations and bride's name' in a specified period of time as they can. The guest with most words will be the winner. You can specify a time limit of 3-5 minutes. 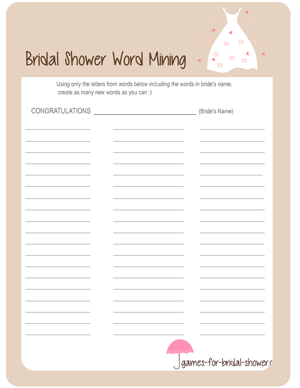 This is an adorable game card for Bridal Shower word mining game. To save the image, click on the image shared above and then right click and save the bigger image to your computer. You can print this game on card stock or ordinary paper depending on your choice and budget. If this classy brown color matches the theme of your bridal shower more, then save this game card shared above. This game is decorated with image of a beautiful bridal dress, hearts and flowers. If lilac color matches the theme of your bridal shower party more, then save the game card image that is given shared above. To save the game card follow the same way, that click on the image shared above and when bigger image opens up, right click and save it or print directly.